Every PowerEdge server also comes with the latest version of the Dell Management Console (DMC) that provides a single unified view of your data center and enables management of multiple chassis and blades — all fed from a single database repository. Whether you need systems designed for your small business or servers to help power an enterprise-class data center, Dell offers preconfigured solutions designed to meet your growing business needs. Businesses with multiple (peer-to-peer) client/notebook/remote users and that need to establish greater control over critical information, centralized file sharing and print services, and that require remote access to data. Small and medium businesses (less than 75 users) planning to deploy a turnkey, cost-optimized, easy-to-manage (consolidated license management) back-office application solution for email, calendar, file and print sharing, remote access, information collaboration, IIS, and security services. Great for Businesses using third-party hosts that need greater control over their content and an increased ability to customize their site and to improve their Web presence. 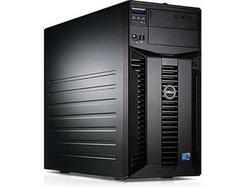 Great for Small and medium businesses requiring dedicated database servers to run demanding business applications. Each solution includes high-capacity direct attach storage for maximum data backup, expansion and security.